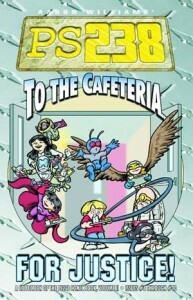 PS238- To the Cafeteria FOR JUSTICE! He has been trying to get me to read PS238 for weeks, and now that I finally picked it up, I have to agree that it’s awesome. I’m already into the fourth volume, and I am glad that I still have a fifth to look forward to on the shelf. For those of us who don’t recognise the nomenclature, apparently schools in New York use this naming system. PS238 is just one more school on the surface, but 3 miles underground it is a high tech, high security school catering to kids with special gifts such as flight, super strength, telepathy, communing with the realm of daydreams, etc. Aaron Williams takes this basic premise and riffs on familiar archetypes while he tells really interesting stories. He goes beyond the obvious ideas and tells small stories about a range of kids and teachers, then adds in bigger arcs that span more than one trade. I’ll keep reading and lending these out as long as Aaron keeps writing them. This entry was posted by florence	on Tuesday, December 2nd, 2008 at 7:53 pm and is filed under issues. You can follow any responses to this entry through the RSS 2.0 feed. You can leave a response, or trackback from your own site.